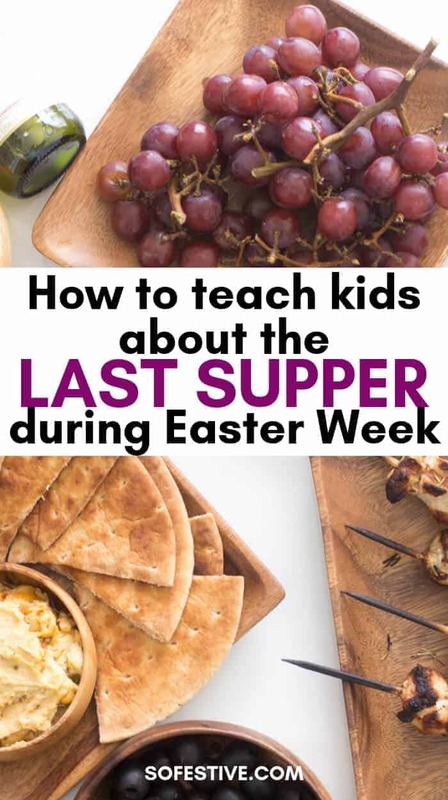 How To Teach Kids About The Last Supper For Easter Week - So Festive! 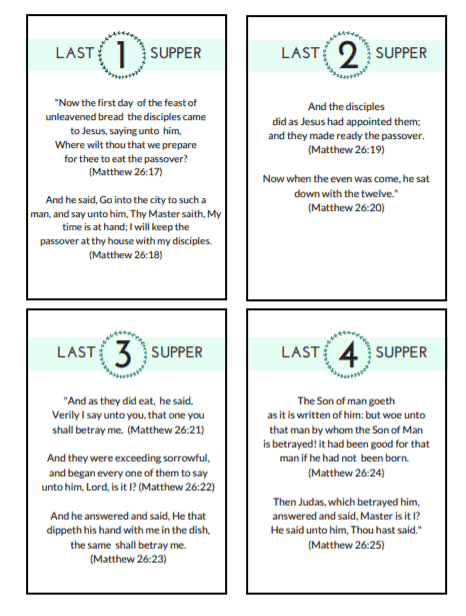 Teach kids about the Last Supper during Easter Week with this family-friendly dinner idea and printable discussion cards! For nearly 10 years now, we’ve had our own family “Last Supper” to celebrate Passover Thursday during Easter Week. I know that those who are Jewish celebrate Passover, but even though we are members of The Church of Jesus Christ of Latter-Day Saints, I thought this would be a special occasion for our family to learn more about the events of Christ’s life, specifically the Last Supper. Our first Passover meal was very simple. We made a slow-cooker lentil soup and had olives, sparkling cider, grapes, and vegetables on the side. It was just my husband and I when we first started this Easter tradition, so it was easy to eat our meal right on the coffee table in the living room and not worry about soup getting all over! Now that we have 4 little children, I have altered our Last Supper menu a bit…to make it cleaner! The great thing about this menu is that the foods are so simple that you won’t be cooking all day! 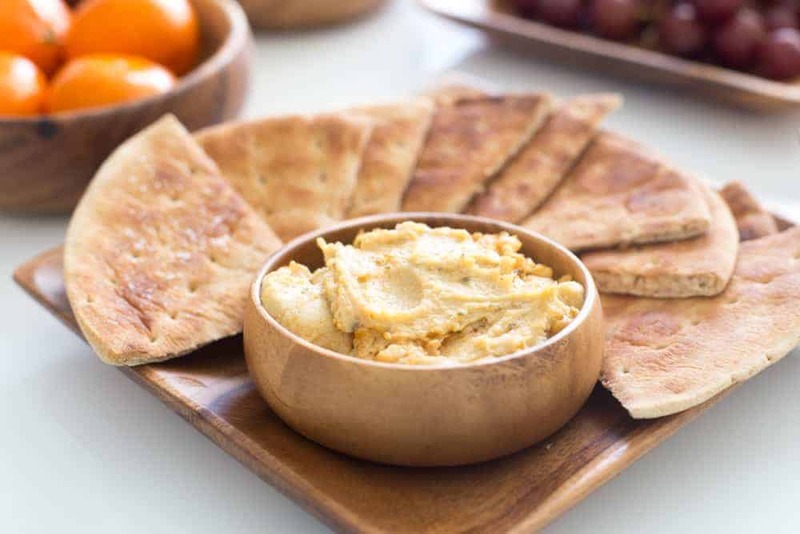 You can serve the food however you’d like, but I invested in some wood platters (similar to these) and I love using them for our Last Supper! Eating on the floor is totally optional, but it will make your Last Supper more memorable! Grab a picnic blanket or tablecloth and place it in the living room or kitchen floor. Set out all your food and you’re good to go! Third, Gather, Eat & Discuss The Last Supper! Years ago when I wanted to create some Christ-centered Easter traditions for my family, I searched for a family-friendly Passover dinner program. I wanted one that wouldn’t take us hours to get through and would be easily understood by my little ones. I could never find one that I loved, so I created our own! Using scripture verses from The Bible, this Last Supper program walks us through what happened on the last Thursday of Jesus Christ’s life including the Last Supper with his disciples, suffering in the Garden of Gethsemane and then being arrested. Since our children are young, we keep the details simple and understandable, but as they grow older, we will be able to get into deeper discussions. The full printable program including step-by-step directions and dialogue is available in our 30-Page Celebrate Simpler Easter Guide. I hope you have a memorable Last Supper together with your family or friends to celebrate Holy Week!